The day we met at the Museum, was a Monday so the Museum was closed, which made it all seem especially exciting. Everything was interesting, the names of fictional orphans or foundlings, on the café wall, the bewildering array of exhibits in the museum and of course the other 26 writers. Conversations began about names and where we come from, what we wrote, of course we all know the answers. The tour was fascinating and very informative, there was so much to take in. Then a welcome cup of tea and the allocation of objects, pulled from an appropriate black, three cornered hat. I really hoped I wouldn’t get the tokens –they seemed so obvious and hard to write about without too much sentimentality; anything else would be fine, though in retrospect I’m sure I would have managed. 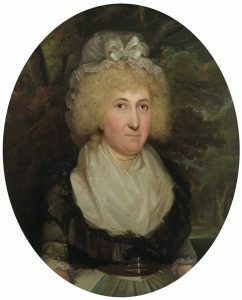 What I did get was the eighteenth century portrait of Mrs Caroline Collingwood which hangs on the first floor landing – a woman with very piercing eyes. I was eight when the foundling Hospital closed and the remaining children fostered. By that age I knew about orphans and orphanages because my mother insisted every two years or so and usually just before Christmas, that my sister and I sorted out our toys, selecting those we were too old for or no longer played with, to make room for new toys. These discarded toys provided a donation for the National Children’s Home, which was housed in a large walled building, I think somewhere in Highbury. I remember going to the orphanage and being stared at by some children in uniforms, who were being shepherded down the stairs and away and being told off for staring back. We saw the babies in their cots who were mostly asleep and certainly not crying. We had to be very quiet, my mother became tearful and I was surprised by how many there were – was probably about eight to ten. The nurse showing us round explained that most of the babies got adopted but the children didn’t; I remember feeling selfish and ashamed because I had parents and a proper home. The appreciation of which was of course at least part of the purpose of the visit. When I began to explore Caroline Collingwood’s details, I drew a complete blank, wherever I searched, nothing in the archive search, nothing on the Museum Website – then I got the email saying the Museum knew nothing more about her than was on the portrait label. She was the wife of Thomas Collingwood and grandmother to Mrs Louisa Plumley. So ironically there was less information about this woman with on the landing than there was about most of the Foundlings. Intrigued by this lack of information I visited her again, sat on the bench and stared at her, listened to people passing and the sound of the clock when there was no one on the stairs. I tried to imagine what life was like for women like her, in the eighteenth century, when most women’s identity and well being, was almost totally dependent on her husband and her other familial relationships. So having an illegitimate child was a huge social disaster for a previously respectable woman who would possibly become homeless and without any means of support, literally an outcaste. For women with very few resources the situation must have been even more drastic and frightening, little wonder the Foundling Hospital was so over whelmed with babies and had to use a kind of lottery system to decide the fate of these children, many of whom would literally die if they where not accepted. I began to think about the foundlings who were taken in, growing up in an enormous institution, never being told who their mothers were. These children were, in spite of the relatively harsh conditions, offered a better future and to some degree more independence than many of the middle class women of the day. They were taught to read and write and most learnt a trade too, so even without a husband the young women could make some kind of way in life. I have no idea where the portrait might have been in the Hospital, if it was on a landing it would have been passed by the children as they went about their daily tasks and lessons. I cannot believe they never fantasised about their mothers and here was a kind looking woman who seemed always to be watching them. Some at least must have dreamed of some kind of relationship with her, maybe too old to be their mother, a grandmother perhaps and one day she would realise who they where and come and rescue them. our guesses come to nothing. secretly dreamed of being hers.